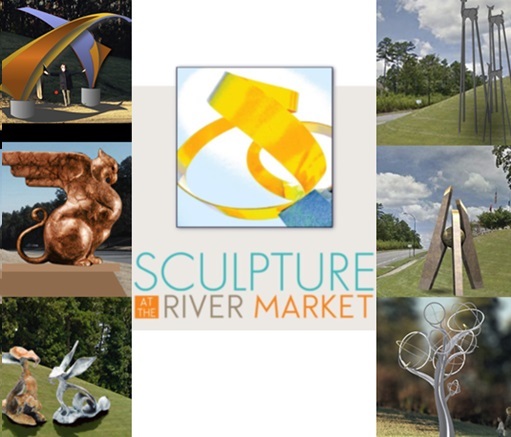 Once again, the Sculpture at the River Market program is sponsoring a $60,000 commission for a new piece of public art. Guests of Friday evening’s preview party will have the chance to vote to select the winner. This is the fifth year for the program. Two of the commissioned pieces have been placed in Riverfront Park, with a third one scheduled for installation in the coming weeks. The fourth piece is located at 2nd and Main Streets next to the parking deck. This year’s selection will be placed in west Little Rock at Chenal Valley Road and Chenal Parkway. Visitors to the Sculpture Show and Sale will be able to see examples of the six finalists on Saturday and Sunday as well as over 700 other sculptures ranging in size from a few inches to over 10 feet tall. Kathleen Caricof: “Embrace” is designed as an entrance sculpture for the intersection. A site-specific sculpture, it would stand approximately 15′ tall and 18′ wide and be made of steel with a rusted outside finish and epoxy paint inside finish. Tim Cherry: “Ancient Wings” features a seated Griffin in a regal pose, with an arched neck and outstretched wings. It would be over 5′ tall by 6′ long and 2′ wide and be made of steel with an interior stainless steel structure. Sandy Graves: “Cotton and Clementine” would be two oversized bunnies in a whimsical design. They would be 6′ tall by 9’9″ wide and 2’8″ deep and made of bronze. Cotton would be white and Clementine would be orange. Adam Schultz: “Standing Together” features three deer in a family group. With elongated legs and stylized bodies, the grouping would stand up to 25′ tall and cover over 120 sq. ft. They would be a combination of stainless steel and aluminum. Stephen Shachtman: “A” is a tripod which represents both Arkansas as a whole (through the steel/bronze portion) and the people of Little Rock (through the flagstone sphere). Each leg is of a different overall length; 16’, 14’, and 12’ tall; sphere in center is 40” in diameter. Michael Warrick: “Mockingbird Tree” is a tree with bubble forms for foliage plus a pair of Arkansas’ state birds. It would be 18′ tall by 11′ wide by 7′ deep. The tree would be stainless steel and the mockingbirds would be bronze. This entry was posted in Public Art, Visual Art and tagged Adam Schultz, Kathleen Caricof, Michael Warrick, River Market, Riverfront Park, Sandy Graves, Sculpture at the River Market, Stephen Shachtman, TIm Cherry by Scott. Bookmark the permalink.